A common anecdote in the Lightning front office since the “Summer of Stamkos” has been the pressure that the NHL salary cap has enforced on their group of developing players. While the Lightning have been successful in developing players from within their own system, sooner or later, they all need to get paid. The Lightning went into the offseason with several high-profile restricted free agents in search of big contracts, as well as a healthy prospect pool which could stand to be their saving grace heading into a season where they will seek to redeem their reputation as contenders. The 2016-17 season saw the Lightning utilize a plethora of those prospects during times of emergency injury call-ups, giving them a grand opportunity to further evaluate the promising group. Heading into the 2017 Entry draft, the Lightning held six draft picks, one in each of the first three rounds, followed by a two-round wait, two sixth-round picks, and finally a seventh. 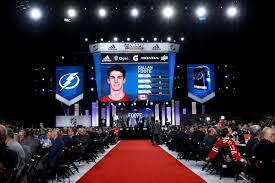 Only days prior to the draft the Lightning had held another second-round pick which was moved along with Nikita Gusev and a 2018 fourth-round pick to Vegas to secure considerations that Vegas would select Jason Garrison in expansion. Today, we’ll recap how those six picks worked out for the Lightning. Son of two-time Stanley Cup champion, Adam Foote, Callan is a similar profile to his father whose style of play remains highly sought after in an NHL rearguard. Cal was ranked 12th overall by both ISS Hockey and NHL Central Scouting among the likes of other eligible defenders such as Erik Brännström, and Timothy Liljegren. Cal is highly regarded for his ability to forecast the play and adapt accordingly. The six-foot three-inch right-hander knows his body well, and has learned mature his game around that strength. Unlike many growing blue-liners like himself, Foote is capable of playing a highly effective two-way game rather than simply exhibiting himself upon a single dimension. 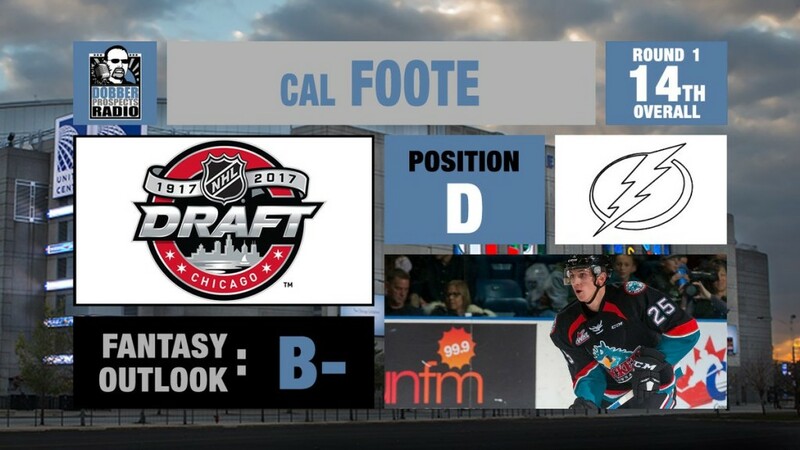 Foote slides into a wealth of defensive prospects in the Lightning system with a clearer path to make his mark on the right-hand side. Al Murray and Steve Yzerman went to left field with this pick, while we’re unsure if there had been an attempt to trade back, the Lightning were comfortable selecting Volkov at 48. Murray made it clear that the Lightning drafted completely according to their pre-arranged list of players, taking the most talented player available at the time of their pick. Volkov played in the SKA organization and was selected by the Lightning in his second year of eligibility. The mystical Russian already possesses components of a responsible winger, but has shown the Lightning staff enough offensive ability to warrant the second-round pick. Volkov likely would’ve played at the World Junior Championship if he hadn’t suffered a broken bone in his foot earlier in the season. He has a deadly wrist shot and the body strength to give himself the ability to use it often. One of the most under-rated steals of the 2017 draft, Lipanov was projected by many to go almost an entire round earlier in the draft. A rather undeveloped frame, Lipanov probably needs to add at least 20 pounds before he will fit the mold of a pro. One of the youngest players selected in the draft though, he’ll have plenty of time to add that weight and strength as he joins the Barrie Colts of the OHL this fall. Lipanov is a skilled and responsible puck handler who seems to show mature judgement in when to pass versus when to rush the puck himself. In both the Ivan Hlinka and World Junior-A Challenge tournaments Lipanov had success in quarterbacking Russia’s successful power play, largely due to his excellent passing and creative hockey sense. The common theme seen in the Lightning draft list, which Al Murray will insist that they selected from religiously, regardless of positional requirement, is a strong presence of a high hockey IQ, and good decision making. Perbix was drafted out of the United States High School system in his second year of eligibility. Relative to his peers in high school, Perbix was capable of putting up impressive offensive statistics. Unfortunately, they are likely to diminish when he transitions to St. Cloud State of the NCAA, while he is pushed to focus on developing a solid defensive foundation. Thankfully, the 6-4 defender should be able to support his freshman season with his strong puck carrying ability, and the ability to be patient in making smart decisions with the puck. He has an accurate shot, however his skating ability may hinder his ability to release it as often as he’d like. The low-probability picks that are the last couple of rounds in the NHL draft saw the Lightning take a couple of “undersized” players who’ve proven at other levels to have superior offensive ability. Guttman, who is listed at 5-10, fits that description entirely. He scored at a point per game rate in the USHL this season, splitting goals and assists evenly at 27 apiece. Guttman’s competitiveness will be his desired route to success at higher levels – a finesse player in the USHL, Guttman will look to develop a bit of grit and scrappiness to push himself to succeed when he joins Perbix at St. Cloud State University. With their last selection in the 2017 entry draft, the Lightning selected a second undersized American center. Sammy Walker, the smallest of all the Lightning 2017 draft picks could potentially be one of the most skilled. As with Guttman, Walker will be a project for the Lightning development staff, but he certainly possesses a level of skill that could compensate for his lack of size. There is no question that Walker will need to add strength, even into this coming season as he joins the University of Minnesota. As a low-probability pick, the bar has been set low for Walker to prove himself. With the Lightning signing key RFA’s Tyler Johnson and Ondrej Palat to long-term extensions, their forward depth will boast some heavy competition. Few spots will be available, especially on the left-wing with Palat, Killorn, and Kunitz being available. Namestnikov could transition to a full time roll at center, however that could lead to a logjam in another area. Tyler Johnson’s seven-year extension could lead to some battles down the middle of the ice where his “lite” version, Brayden Point, will hope to earn an increase in ice time from last season. Yanni Gourde served as a valuable depth option during his opportunity last season, and could become more of a main-stay, squeezing Cedric Paquette out of the lineup with a healthy roster. Gourde is versatile, but best suited down the middle – he will be an interesting player to watch in the fall. The Right-wing position is wide-open after staple first-liner, Nikita Kucherov. J.T. Brown earned the approval of Coach Cooper in a hybrid-grinding role last season, but with the return of Ryan Callahan, he could be passed over in favor of a higher skilled prospect. That leaves either one or two spots open on the right side for what could turn out to be the most available and interesting positions at camp. On the blue-line, the Bolts stocked the shelves early in the offseason after losing Jason Garrison to the Vegas Golden Nights. The Lightning have plenty of options outside of Victor Hedman and Anton Stralman to fill out the top-6, which is where the real camp battles will be found. Among veterans Dan Girardi and Braydon Colburn who should will likely fit into regular roles, there will be two spots looking to be filled. Assuming Cooper will favor handedness in his decision making, we’ll see the need for one left-handed and one right handed rearguard. The top candidate on the right side is likely Jake Dotchin who became a mainstay with Hedman during his rookie audition. On the left side, Slater Koekkoek will finally experience a higher level of pressure from newly acquired Mikhail Sergachev who will also look to crack the Lightning game-day roster. The Lightning hosted their 2017 Development camp from June 27 through July 1 at the Brandon Ice Sports Forum in Brandon, Florida. In attendance were selections from the three previous drafts, as well as free agent invitees Bobby Dow, Kevin Hancock, Cole Smith, Cameron Johnson, and Joseph Raaymakers. Several prospects from previous drafts seemed to make positive impressions during development camp including, in particular Erik Cernak, and Dennis Yan who both demonstrated a high level of skill to go along with their more developed frames – both should play in Syracuse this fall and have opportunities to earn emergency call-ups. Two first round picks, Brett Howden and Mikhail Sergachev were impressive, as expected, both demonstrating their smooth skating ability, crisp passing and strong shooting. All of the 2017 forward draftees seemed to justify the picks used to select them. The later round Americans, Sammy Walker, and Cole Guttman proved to be effective in 3 on 3 competition despite their lack of physical development. Nick Perbix did well, but struggled to stand out among the other strong defensive prospects in attendance.